The Grand Sierra Resort is the largest resort and casino in northern Nevada with over 25 million dollars in public area and room renovations with still more to come. Our property is the perfect destination for the business traveler or leisure guest. We offer a full service business center and 200 000 square feet of meeting /convention space. We feature the largest number of amenities in the Reno area including 11 restaurants 8 lounges/bars 24 hour room service /state of the art health club/ 2 screen movie theater / 50 lane bowling center/ live entertainment in our 1800 seat Grand theater. Our property is the finest in Reno. Grand Cafe: Newly renovated/open for breakfast/ lunch and dinner serving popular favorites. Starbucks: Serving coffee beverages/ pastries/ salads/ sandwiches and more/. Briscola: Italian and mediterrian cusine prepared family style. Rim: Rim offers a variety of Asian cusinine. Try our new sushi bar. Round Table Pizza: Classic Round Table Pizza open weekdays 11AM-10 PM. Fri-Sat 11am-11pm. Cantina: Try our new Cantina bar. Cantina offers over 100 types of tequilla. Port of Subs: Enjoy one of Port of Subs many delicious sub sandwiches. Mon-Thurs open from 9am-8pm. Fri-Sat 8am-9pm. Sunday 8am-8pm. Charlie Palmers Steak: A true gourmet restaurant featuring the finest steaks seafood and the specialized are of tableside service. Elements Buffet: Elements offers daily all you can eat buffets along with live action cooking. Johnny Rockets: A nostalgic burger joint featuring thick shakes/ cherry Cokes and oldies on the jukebox. 2nd Street Express: Express food- sandwiches/ salads/ soups/ pastries/ coffee etc 24 hrs. Mezzanine Meeting Rooms: Ten meeting rooms, minimum charge is by room. The Grand Sierra Resort is the largest resort and casino in northern Nevada. Our property sits on 146 acres and is located just 5 minutes from the Reno Tahoe International airport and 10 minutes from downtown Reno. 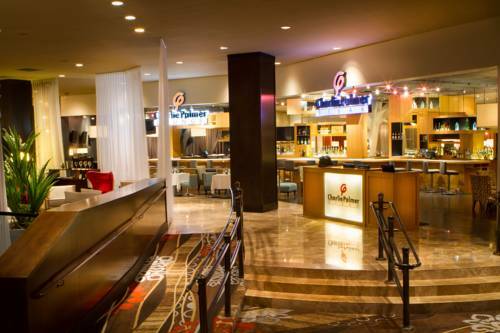 The Grand Sierra Resort is the perfect destination for the business traveler or leisure guest. We are located 4 miles from the Reno-Sparks convention center and 3 miles from Industrial Way. We look forward to having you as our guest.